Pimpex Plastic, China supplies thermal shrinkage film machine, blown film extruder, plastic film blower, etc. 2. Screw's Materials Barrel adopts 38CrMoAl alloy steel with nitrogen treatment. 3. Screw diameter is 65mm, L/D rate is 30:1. 4. Screw speed is 15-120r/min. 5. The main frequency speed control motor has power 15KW. 6. The Fi100mm mould head adopts top grade steel with forge machining, quench treatment, accurate grinding, electroplating. 7. The Fi50mm cooling air ring is made from cast aluminum. 8. Maximum output capacity is 60Kg/h. 9. Film thickness is 0.02~0.2mm. 11. Temperature control system adopts 6 heating zones with intellectualized digital display. Lead Time: around 30 days after Seller's receipt of down payment. Quality Guaranteed Period: One year if Buyer correctly operates equipments and keep necessary maintenances. Of course, those wearing parts and non-special purpose items are not listed in guaranteed list, such as straps, chains, bearings, knifes, etc. 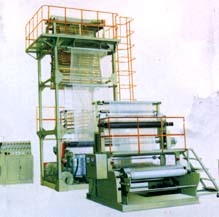 The manufacturer presents plastics formulation and all necessary process parameters to Buyer. The manufacturer offers long term technical supports and spare parts at costs level.